A good friend of mine who, for the purposes of this review, shall remain nameless, has been an ardent supporter of the Rhumbelow Theatres over the years. It is to be expected that having seen so many shows, he might have become a tad jaded, and has lately been of the opinion that for a show to stand out from the others and really grab his interest, it needs a certain amount of what he refers to as “eye-candy”. At the risk of being called a male chauvinist, I must say I find myself in total agreement. Fortunately, The Foxy Four provides all the “eye-candy” that any red-blooded theatre-goer could desire, and a whole lot more! 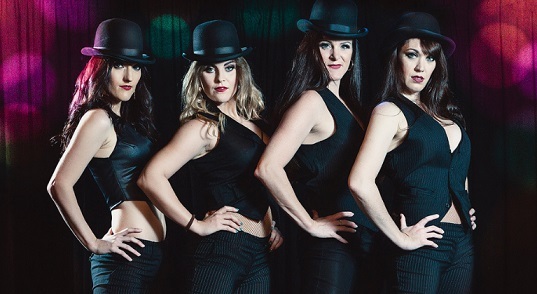 The show features four very spirited performers – the evergreen and ultra-professional Marion Loudon, the vivaciously appealing Leigh Meyer, the slim bundle of energy that is Jemma Kate Badenhorst, and blonde newcomer Camilla Rogers. The four certainly bring a great and at times almost manic energy to the stage with numbers that were instantly recognisable and appealing to the opening night’s highly appreciative audience. There is no point in listing all the song titles, but just to give potential theatre-goers an idea of The Foxy Four playlist, expect numbers such as I’m Coming Out, which gets the show off to a great start, Shoop Shoop, Call Me, Manic Monday, Respect, Royal (Leigh and Kate at their best), Chandelier (beautifully done by Marion and Camilla), At Last (a Kate solo), an Adele medley (standout performances by Leigh and Kate) and a rap medley, very well handled by Kate and Marion. The girls all have their moments as soloists, and also perform in a variety of combinations, but for me they are at their best when all four are on stage, notably in The Clapping Song and their ethnic sequence (Hamba Nawe and Hell Fire) which, in my humble opinion, was the highlight of the show, featuring great choreography and a simple ethnic costume. Speaking of costumes, The Foxy Four is a non-stop parade of everything glitzy, glamorous and even a tad risqué. For me, it felt that at times the girls were trying too hard to showcase the costumes, with some of the changes so quick that it led to performers being a beat or two late arriving on stage – a small quibble. Interspersed with the parade of songs and costumes are vocal clips from members of the local performer community, describing their best “foxy” moments, most of which ended up in disaster of some kind! Hats off to the ladies for trying to create something different for their show, with much credit to them for the effort and creativity put into staging The Foxy Four. The show is very entertaining but could do with a few “tweaks” introduced by asking a seasoned professional to cast a beady eye over the proceedings. But the girls know what is needed, and will no doubt introduce more (or less, whichever is needed) to the show as it progresses. So if you’re looking for a foxy night out, this show is for you! Performances take place from November 28 to December 9 with shows Wednesday to Saturday at 20h00 and on Sunday at 14h00. (The show on December 8 is sold out). The theatre venue opens 90 minutes before show for drinks.